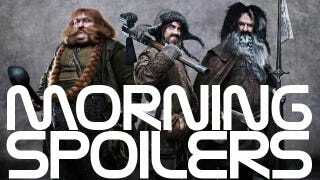 Peter Jackson reveals why The Hobbit is nothing like Lord of the Rings! Roberto Orci is layering subtle clues for the Star Trek sequel into the tie-in comic. Matt Smith once again addresses his Doctor Who future. And do we already know where the next season of American Horror Story will be set? "One of the great things about working with Bob [Orci] is that we are able to use the ongoing series to very subtly lay in clues to the next movie. There might even be a tiny hint of a subplot in the first issue." Director J.J. Abrams returns to the topic of the alternate timeline, and explains why it's still important even if time travel will no longer be a plot point going forward: Here's the thing… I think the key to that was, first of all, it was one of those things that not everyone even cares about or understands the timeline of it all. The notion that when this one character, Nero, arrives in his ship, that basically the timeline is altered at that moment, so everything forward is essentially an alternative timeline. That is not to say that everything that happened in The Original Series doesn't exist. I think, as a fan of movies and shows, if someone told me the beloved thing for me was gone, I would be upset. But we didn't do that. We're not saying that what happened in that original series wasn't good, true, valid, righteous and real. Let people embrace that. We're not rejecting that. That, to me, would have been the big mistake. We're simply saying that, "At this moment, the very first scene in the first movie, everything that people knew of Star Trek splits off into now another timeline." "The Hobbit is very much a children's book and The Lord of the Rings is something else; it's not really aimed at children at all. I realized the characters of the dwarves are the difference. Their energy and disdain of anything politically correct brings a new kind of spirit to it. And that's why I thought, OK, this could be fun!" "That was something I worried about. I imagined 13 guys with long hair and beards and I thought, 'How are we ever going to know which dwarf is which? It's an ensemble from hell really. I thought nine members of the Fellowship was a problem; but here, with Bilbo and Gandalf, we've got 15. It's working out fine though. The dwarves give it a kind of childish, comedic quality that gives us a very different tone from The Lord of the Rings." "I want it to seem like we've gone back on location into Middle-earth; that these two movies feel like they belong at the beginning of the other three. We're the same filmmakers going into the same world." Jackson also says that the films do retain some aspects of original director Guillermo del Toro's style and DNA, but these have largely been overshadowed by Jackson's own attempts to replicate his approach to The Lord of the Rings ten years ago. "We always saw The Hobbit more in the golden light of a fairytale. It's more playful. But by the time you get to the end, Tolkien is writing himself into that place where he can begin that epic journey of writing LOTR, which took, as he put it, his life's blood. All those heavier, darker themes which are so prevalent in the later trilogy start to come into play." "No. I am very happy to stay. I love it and love making the show." Here's a sneak peek for the next episode, "Chuck vs. the Baby." "I don't think it really affects their relationship all that much. One of the things that Chuck's always done is kind of built something up to be really monumental, but then we sort of begin and end all in one episode, so– and not that there aren't remnants of that that won't come back or carry on in their relationship in some ways, but it's kind of one of those things. It's big, and it's cool, and for fans to get that bit of extra more backstory that is revealed in the next episode, but it's not like relationship-changing or anything." "I always love going into a flashback episode. We meet my mother in the show. That was always a big piece of the puzzle for me that I wanted to close in this series. We knew about Sarah's dad, but I wanted to know, and I'm sure everybody else wanted to know, what happened with Sarah's mom. It's beautiful. It's a good story. I love going back in time, and there's some flashback stuff in there, too. It really shows the journey. Overall, I'm really happy with the journey that Sarah Walker has had, from the emotionally stunted spy who didn't know how to express herself, going into somebody who was more emotional and could express that, and then getting into more of the comedy stuff on the show, as she fell into a normal relationship– as normal as you can get with somebody when you're a spy. It's been a really nice evolution." Horowitz: I think sometimes these things have a different effect and they manifest themselves differently. I think the way Emma is going to react to it is going to be much more of an emotional reaction than a mythological reaction. Kitsis: But Graham's death hangs over the next episode in what we hope is a very deep way, and it reaches out and touches a lot of people in the town. And that's what we explore in that episode. Horowitz: Exactly. And the next episode picks up a few weeks after. It's not literally the next day. Well, I think that is exactly - when you say "What's her reaction to his death?" I think the thing she took away from episode 7 was that Graham died trying to free himself from the pocket of the mayor. Therefore, she's not going to let that badge go to anyone but her. And I think the badge becomes her emotional connection to Graham. Emma is somebody who, in this stage of her life, has never had a home. She's always gone from place to place and she's always walled herself off from people because she doesn't want to get hurt. So a situation like this sends her back more than it puts her forward because her walls come up. Here are four sneak peeks for the midseason premiere, "Desperate Souls", which airs January 8 and is written by genre mainstay Jane Espenson. "Go through it frame by frame. I planted it in there. I will never reveal it." To that end, speculation has already started on where season two might be set. Two possibilities that have been thrown around include Vermont, as a clip of the Vermont-set sitcom Newhart opened the episode, and Florida, which was repeatedly mentioned as where Vivien's sister Jill lives. Another possibility is a prison somewhere, which Sarah Paulson's psychic Billie Dean Howard alluded to when she discussed paramagnetic grip, declaring, "You see it all the time in places like prisons or asylums. Negative energy feeds on trauma and pain. It draws those things to it."